Is Gilead Still an Attractive Long Term Proposition? It has been 466 days (as of Thursday, 11/12/15) since our last article on Gilead (GILD). 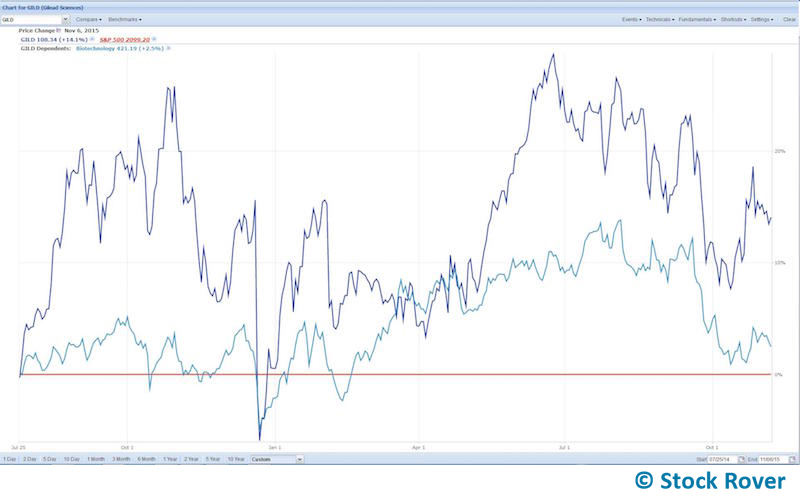 Since then (July 2014), Gilead has beaten not only the S∓P 500 but also the biotechnology industry as shown by the price chart below (S&P 500 is the baseline; Gilead is in blue, its industry is in light blue, and the S&P 500 is in red). Its share price has risen 16.52% and is currently trading at $104.23 (11/12/15). During this period, Gilead hit new highs of $122.21 before pulling back to its current level. In collaboration with our friends at bivio (Gilead is one of the top holdings of bivio investment clubs), we decided to do another piece on Gilead to see what has changed about the company. The recent earnings release for 2015 Q3 revealed that revenues have risen 37.29% while net income rose 68.58%, year over year. Additionally, Gilead continues to increase shareholder value; its EPS for 2015 Q3 rose 83.23% year over year. Furthermore, the company’s commitment to shareholders has been displayed through its decision to start paying dividends in February, 2015. 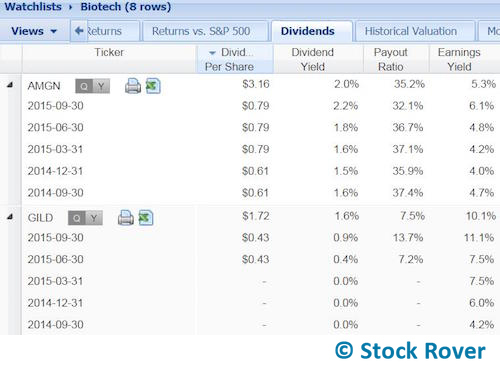 Gilead’s dividend yield for the year, 1.6%, is projected to be in the ballpark of Amgen’s yield, 2%, even though Amgen has been paying dividends since 2011. What are some investor concerns? What risks is Gilead facing? Gilead is a research-based biopharmaceutical company that discovers, develops and commercializes new medicines for different medical sectors. The Company’s primary areas of focus include HIV/AIDS, Liver diseases such as Hepatitis B and C and serious cardiovascular/metabolic and respiratory conditions. Its products include Stribild, Complera/Eviplera, and Atripla for HIV; Harvoni, Sovaldi, and Viread for Liver diseases; Zydelig for leukemia; Letairis, Lexiscan/Rapiscan, and Ranexa for cardiovascular conditions; and Cayston and Tamiflu for respiratory illnesses. In 2013, Atripla and Truvada were the golden geese, in 2014 Sovaldi was the moneymaker and in 2015 Harvoni has been the main cash cow. 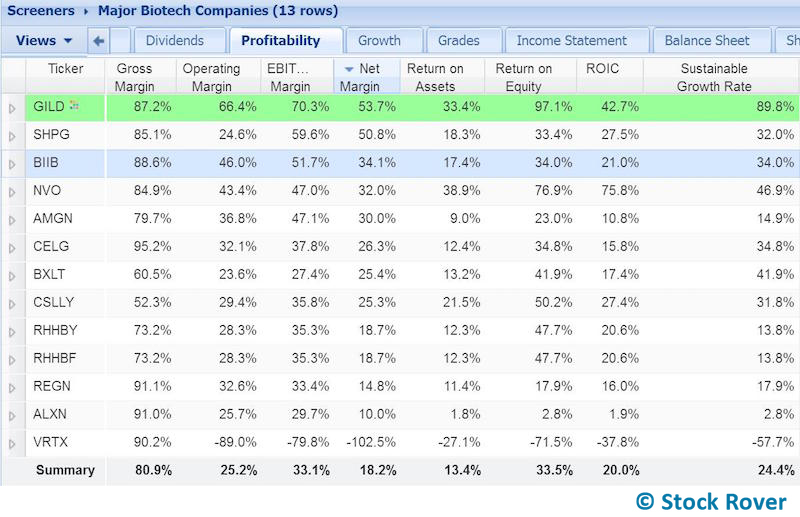 The following are Gilead’s major biotech competitors ranked according to market capitalization. The list is not comprehensive because I restricted the screener to the biotechnology industry and a market capitalization above $20 billion. In reality, Gilead also faces competition from smaller biotech companies and from drug manufacturers like Johnson & Johnson. Celgene (CELG), Amgen (AMGN), and Biogen (BIIB) are not as profitable as Gilead because even though they may have higher gross margins (sales less cost of goods sold); those margins do not pass through to their bottom lines (net margins). Among these competitors, only Shire (SHPG) comes close to matching Gilead’s net margin however, Shire’s operating margin is significantly lower than Gilead’s—a sign of operational inefficiencies. Gilead, on the other hand, shows high operational efficiency and its high margins (highest operating margin, the highest EBITDA margin and the highest net margin) translate into shareholder value as reflected in its high return on equity (ROE) of 97.1% compared to Shire’s 33.4%. Additionally, Gilead shows effective capital allocation that its competitors do not—reflected in its high return on assets (ROA) and return on invested capital (ROIC). Since our last article, Gilead’s capital efficiency has risen; ROIC was 19.75% it is now 42.66%, ROA was 16.31% it is now 33.40%, and ROE was 34.21% it is now 97.12%. The chart below shows this improved capital employment. 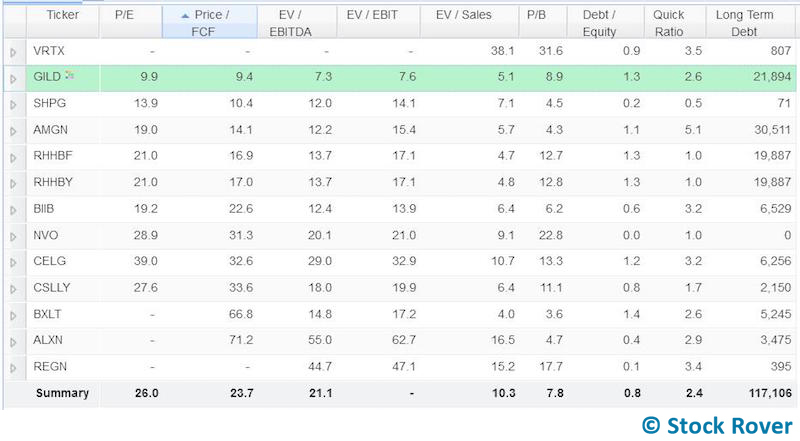 Even with a highly restrictive valuation metric like Price to Free Cash Flow (similar to Price to Cash Flow but uses an exacting measure of cash flow, by subtracting capital expenditures), Gilead is still relatively undervalued, likewise with the EV to EBITDA and EV to EBIT metrics. On the EV/Sales metric, Gilead is third—with Baxalta (BXLT) taking first and Roche Holding ((RHHBF) & (RHHBY)) taking second—mainly because of its rising debt (which should not be a concern, more on this later). Growth seems to be the area where Gilead slightly lags its peers but it is no slouch in this category either. 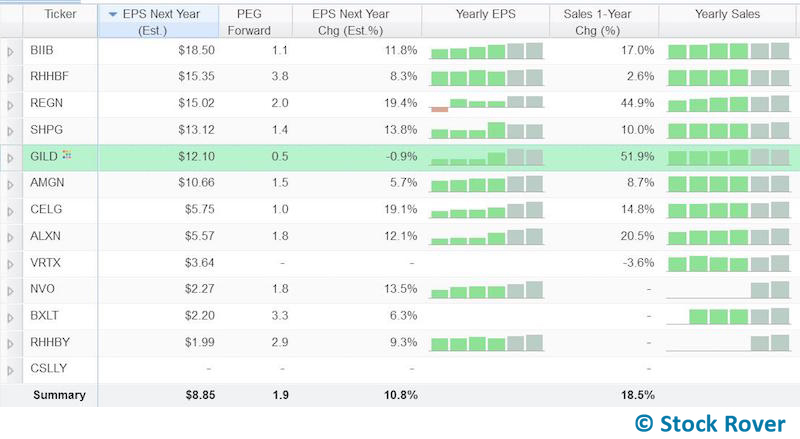 Gilead is in the top five of biotech companies with the highest estimated EPS for next year and the lowest PEG (Price Earnings / Growth forward) by far. The sales change for the past year shows Gilead, at 51.9%, had the highest sales change so the negative estimated EPS change for next year is the result of sales growth normalizing after a big jump. Over the next year, the growth Gilead has seen from Harvoni and Sovaldi sales, especially in the US, should normalize and eventually start to decline. As shown below, next year’s sales are estimated to decrease by 1.6%. Still, Gilead has a habit of breaking expectations and it would not be too much of surprise if they broke them again (some analysts find that the market has become so used to good news that Gilead needs an EPS increase of about 15% for the market to respond positively). When we first wrote about Gilead, the sales growth estimate for that year (2014) stood at $22.6 billion, the sales graph above shows that Gilead beat that estimate. The next year’s sales (2015 sales) were estimated at $26.2 billion, but going by management’s guidance, that estimate should be beaten this year as well. Based on this trend, the estimated $31.6 billion in sales for next year will most likely be beaten as well. The growth needed to beat those estimates will come from international markets and new product categories. As Harvoni and Sovaldi sales normalize in the US, they are expected to grow internationally especially in Japan. Both Sovaldi and Harvoni were only recently introduced in Japan (Harvoni was introduced in July, 2015 while Sovaldi was introduced in March, 2015) and have not yet reached market saturation like they have in the US. That makes Japan a growing market and sales of Harvoni and Sovaldi should continue to grow there. According to the Asian Pacific Association for the Study of the Liver, there are about 2 million HCV patients in Japan. Aside from Amgen (AMGN), Biogen (BIIB), Celgene (CELG), and Shire (SHPG), Gilead faces general competition from not only small biotech firms but also big drug manufacturers. For instance, AbbVie (ABBV)–a drug manufacturer—competes with Gilead in the Hepatitis C space (HCV). It has HCV treatments that compete with GILD’s regimens. However, FDA warnings that AbbVie’s HCV treatment could cause serious liver damage to patients with underlying liver disease diminishes the regimen’s viability as a competitor to Gilead’s drugs. Furthermore, Gilead competes with ViiV Healthcare (the Pfizer and GlaxoSmithKline joint venture) in the HIV product space. Nevertheless, Gilead is better positioned to dominate the HIV space because it has more HIV drugs in the pipeline, one of which (Genvoya) just got approved. Gilead seems like a golden investment, so why does the market continue to undervalue it? I think the market is missing the following points about Gilead. 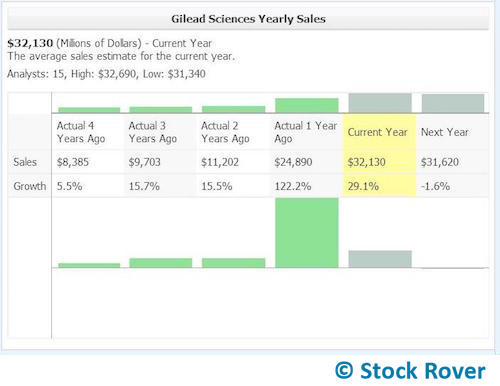 As shown in the profitability snapshot, Gilead as at the top of the food chain when it comes to margins. Save for the quarterly fluctuations (usually spikes from new drug approvals or dips from acquisitions) their normalized margins for the last 10 quarters have been on the rise. The market misses the fact that Gilead has grown and maintained great margins for almost every quarter, as shown below. This trend should continue in the future because of international growth and new products. GILD has hedged against pipeline setbacks by having many products at different research phases and by acquiring companies that add to its pipeline. These acquisitions not only strengthen the existing pipeline but also add extra products that offset ones that do not get approval. The strategy appears to be very effective. Gilead recently submitted a New Drug Application to the FDA for pan-genotypic Single Tablet Regimen for Chronic HCV infection. The drug has already been assigned a Breakthrough Therapy status because it offers high cure rates and has the potential to simplify treatment by eliminating the need for genotype testing. Additionally, as discussed earlier, Gilead has a strong HIV/AIDS pipeline that is starting to flow beginning with Genvoya. 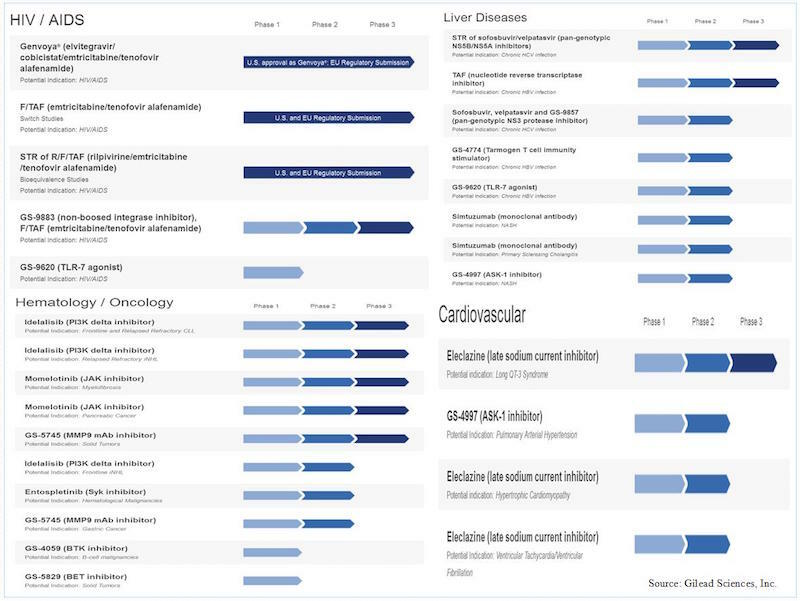 Furthermore, Gilead has one drug under phase 3 clinical trials in its Cardiovascular Diseases pipeline, two drugs in phase 3 in its Liver Diseases pipeline, and four drugs in phase 3 under its Hematology/Oncology pipeline. In January 2015, Gilead began a $15 Billion stock repurchase program that has so far only repurchased 28M shares totaling about $3.1 Billion as of September 30, 2015. Additional repurchases for the remaining $11.9B should help bring the stock price up to its fair value. Gilead’s long term debt increased 83.7% from $11.9 Billion to 21.9 Billion. As of September, 2015 Cash, Cash Equivalents and Marketable Securities totaled $25.1 billion. Why would a profitable company with $15 billion from operations borrow $10 billion more to keep the total as cash? I believe this is in preparation for another acquisition. Based on Gilead’s track record of making valuable acquisitions, its next acquisition will significantly add to its pipeline and revenue. Although an acquisition may adversely affect profitability for the next quarter or so, it would in the long run increase Gilead’s revenue and revenue streams. The acquisition may not be anytime soon but borrowing $10 billion before the fed hikes interest rates is a smart decision. If the current cash pile is not used for an acquisition, it’s a safe bet that management would direct it towards research and development or the share buyback program. Gilead’s past efficiency at utilizing capital (as shown earlier in the ROIC, ROA and ROE graph) should allay any investors’ fears about the company’s rising debt. The $25 billion in cash might offer a clue as to what companies Gilead may be considering for acquisition—those with an Enterprise Value (market cap plus debt minus cash) of about $25 billion or less. The following screener shows potential acquisitions for Gilead. However, it is not comprehensive as it is restricted to US and Canadian companies. Additionally, I restricted it to biotech firms with an Enterprise Value between $5 billion and $25 billion. This is not the first time there have been concerns about Gilead’s growth prospects. There were concerns about Sovaldi being a lucky shot but then Gilead produced Harvoni. Such concerns however, should be there because they fail to acknowledge that Gilead has a strong pipeline that produced Harvoni and other winning drugs before it. Gilead’s strong pipeline, as shown earlier, should continue to produce new breakthrough drugs. Nonetheless, such concerns did not come out of the blue, Harvoni sales for 2015 Q3 came in at $3.3 billion; they are down 7.6% sequentially. Sovaldi sales were $1.5 billion; they are also down 47.6% sequentially. Harvoni and Sovaldi are Gilead’s bread and butter, accounting for 58.43% of revenue for 2015Q3. That they are both down sequentially should rightly concern investors. Is Gilead facing lower demand and consequently low growth prospects? Or is this just normal quarterly revenue fluctuation that most companies experience? I think the reason for the sequential decline in sales is twofold. One, the slowdown is the natural trajectory for drug sales that initially have a lot of uptake. The Harvoni sales growth rate (51.9% last year) should come down to a stable level overtime and continue to decline until Harvoni is phased out or replaced by another drug. Two, part of the reason for Sovaldi sales decline is that they are being cannibalized by Harvoni sales since both are Hepatitis C drugs and Harvoni is a combination of Sovaldi and Ledipasvir. In 2014, Sovaldi brought in $10.28 billion in sales while Harvoni fetched $2.13 billion. For 2015, the Q3 results show that Harvoni and Sovaldi have traded places, Harvoni brought in $10.52 billion while Sovaldi brought in $3.73 billion (for the nine months ended). But overall, although sales are down sequentially, they are up year over year; US sales are up 33.21%, European sales rose 16.83%, and International sales are up 217.4%. Gilead has raised its annual sales guidance from $29-$30 billion to $30-$31 billion. The new guidance translates into an expected sales growth rate 24.49%. 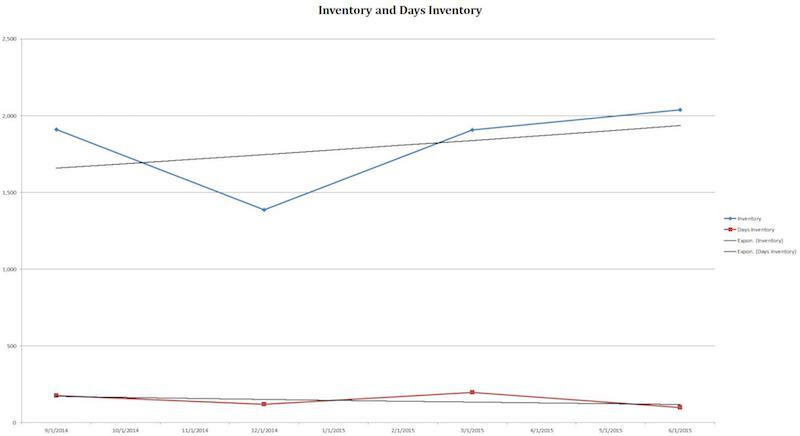 I also think that demand is still solid because since September 2014, Inventory has been rising while Days Inventory (number of days it takes to sell the current inventory) is falling. An increase in inventory would have been a problem if Days Inventory was rising because that would indicate that the company was finding it difficult to sell its products. But as shown by the trendline below, Days Inventory is falling. This is another growth related concern but it really should not be a concern. The argument is that by curing patients of Hepatitis C, Harvoni and Sovaldi shrink their market and consequently cannot guarantee perpetual income. Revenue from Harvoni and Sovaldi sales will decrease overtime as more patients become cured—that is true. But is not that the natural trajectory (bell-shape) of every drug, even maintenance ones? Initially, any new drug is going to have increasing sales until those sales normalize and eventually start to decline. This is true even for maintenance drugs because as their patents expire, generic manufacturers enter the market and drive down prices. Cures, on the other hand, do not have wait for their patents to expire, they destroy the market as they cure people and eventually there will be no market left for generic manufacturers to take advantage of. So the trajectories of both maintenance and cure drugs, I think, are very similar. But cures possess this advantage over recurring drugs. While they are destroying their market, cures are not subject to the threat of competition (after all they are normally breakthroughs) thus they can keep their prices high. Harvoni, for example, costs more than a $1000 a pill and its entire 12 week treatment regimen can cost as much as $100,000. It can keep this price for the entirety of its lifespan. Ultimately, it can match or even beat the lifetime earnings of a maintenance drug. The only credible threats to Harvoni maintaining that price would be government action and political backlash rather than alternative HCV cures because Harvoni currently has no real competition. For example, in July 2014, the Committee on Finance sent a letter to Gilead asking it to explain the pricing of Sovaldi. Additionally, the Southeastern Pennsylvania Transportation Authority (SEPTA) sued Gilead for “exorbitant pricing” of Sovaldi but Gilead, in May 2015, managed to get the motion dismissed. As discussed, this should not be too of much of a concern when Gilead is so efficient at allocating capital. If the new debt will not be used for an acquisition, it will be plowed into the share repurchase program, research and development, and future capital expenditures. And given expectations that the Fed may hike interest rates in the December, funding development at today’s low interest rates is a smart move. Obviously, I feel that Gilead is an incredibly strong company. However, anyone thinking about investing in it should be aware of these risks to the company’s profitability. Gilead gives customers rebates to encourage uptake of its products but these end up cutting into the company’s margins. Increasing discounts/rebates coupled with declining volumes can significantly reduce Gilead’s bottom line. Gilead’s accounts receivable are up 31.72% since December 31, 2014 because of delays in payments from government owned or government supported customers especially from Spain, Italy, Portugal and Greece. Additionally hospitals tend to accumulate large balances before settling them. A default by any of the aforementioned governments could result in a revenue loss of $1.8 billion. Gilead has been very successful with previous acquisitions e.g. the Pharmasset acquisition. There is no reason to think this will change, however, in the event that it makes an acquisition with its $25 billion cash pile and the acquisition does not turn out to be as successful as the Pharmasset deal, GILD would have fewer revenue streams and still be left with $21.89 billion in debt to pay back. A few things may have changed about Gilead since our last article, but the conclusion is the same: Gilead is still fundamentally undervalued and remains a long term play. The stock’s pullback from the all-time high of $122.21 to trading around at $108 presents an attractive valuation for longer term investors. Gilead will continue to grow its revenue in the future through new products in its HIV/AIDS product category and developing international markets. Such growth will be bolstered by Gilead’s large share buyback program, solid profitability, strong pipeline, and potential acquisition.